Cat Eye Coloured Contact Lenses are a range of coloured contact lenses, which are perfect for a night out! These lenses will stand out as you gaze around and make eye contact with other guests, rendering people immobile once they see your crazy coloured contact lenses- they won't be able to look away. Imagine looking like Madame Hooch from Harry Potter, with these fantastic coloured contact lenses! 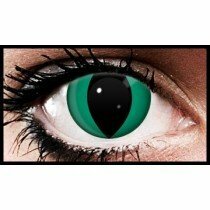 These coloured contact lenses are reusable and are absolutely purrrfect for special occasions and Halloween. Petrifeye Crazy Coloured Contact Lenses cover all desired states of fancy dress, from the very funky, to the very wild. These coloured contact lenses also last 90 days after the first day of opening. Plus, their 38% water content will ensures that your eyes stay hydrated and fresh all day long. They're ideal for Halloween, fancy dress, cosplay and festivals.